This question was posted the Prevention and treatment of moderate acute malnutrition forum area and has 9 replies. You can also reply via email – be sure to leave the subject unchanged. what is the standard for MUAC gain in management of acute malnutrition programs? I think this question has just been answered by Mark Myatt in another thread. Have a look at this discussions: http://www.en-net.org/question/885.aspx and http://www.en-net.org/question/602.aspx which should help. I would also be interested to know this. I am currently doing a project in this area and have found 0.3- 0.6 mm/day to be the range in publications. 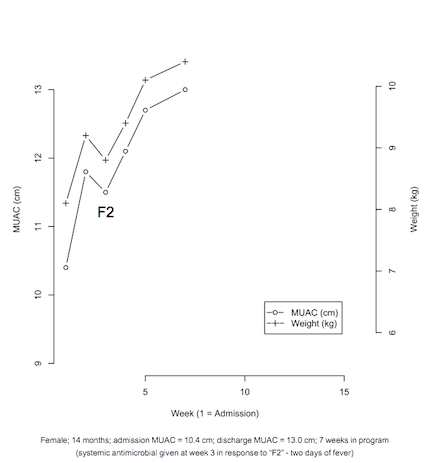 The acceptance of MUAC as an independent admission criteria has led to some programs moving to admit and discharge on MUAC and work has started on evaluating MUAC as a monitoring tool (the plot above comes from a study of this application). A MUAC only programming mode (i.e. MUAC for admission, monitoring, and discharge)n may help to further decentralise CMAM programming. As far as I know ... no standards have been decided. We do have some indication of what can be achieved (as a program median) in CTC / CMAM programs from a number of observational studies (i.e. between about 0.25 mm and 0.5 mm ... I usually see 0.3 mm to 0.4 mm per day). Note that these medians are for all children over all successful treatment episodes. We would expect variation and higher gains earlier in a treatment episode. I think that we now know enough to say that MUAC can be used for monitoring response to treatment but we do not know how best to do this. I think we can move forward by treating MUAC as we have (and do) weight and expect gains between each contact. One change would be that we would not expect MUAC to drop in response to oedema loss. Work is ongoing on developing and testing a MUAC response monitoring tool (anyone want to help with this?). Thanks for this Mark, it's been really helpful for my project and we are hoping to get the results published after I've submitted it for my masters, so there will be some more evidence in the pool for MUAC for monitoring and discharge soon I hope. I'm interested in helping with the MUAC response monitoring tool if I can... I am just finishing up my masters so will likely have some free time on my hands soon! Do get in touch if you think I can help at all. I will contact you outside of this forum. As an aside ... be wary of putting your e-mail address in messages on sites like this as spammers have robots crawling the web for addresses and use viruses to pull e-mails from mailboxes. Best to use something like "my email address is mark06539@brixtonhealth78621.com (without the numbers)". It fools the stupid. I will contact the forum moderator to have your mail address garbled. Oh whoops! Didn't think of that, thanks Mark. I would delete the comment but it doesn't seem I can. I have asked the moderator to edit the message. I have removed Alice's email address. Just to let others know, if you wish to share your email address with someone following a discussion on the forum you can simply advise them to contact the en-net moderator and we will be able to pass it on to them with your permission.